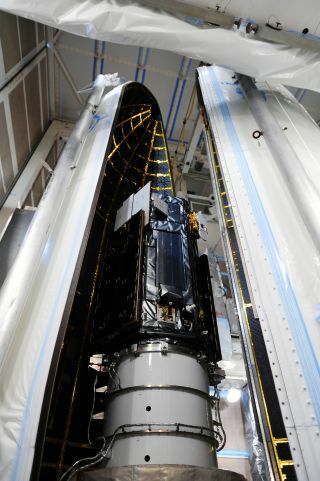 NASA's Orbiting Carbon Observatory-2 is encapsulated into the Delta 2 payload fairing at Vandenberg Air Force Base in California. OCO-2 is scheduled to launch at 5:56 a.m. EDT on July 1, 2014. NASA's first spacecraft dedicated to studying carbon dioxide in Earth's atmosphere has been cleared to blast off Tuesday (July 1), and you can watch the launch live in a webcast. The space agency's Orbiting Carbon Observatory-2 satellite (OCO-2) passed its launch readiness review Sunday (June 29), meaning the craft is set to lift off Tuesday from Vandenberg Air Force Base in California at 5:56 a.m. EDT (0956 GMT; 2:56 a.m. local time) atop a United Launch Alliance Delta 2 rocket. NASA TV will host a webcast of the OCO-2 launch starting at 3:45 a.m. EDT (0745 GMT) and you can watch it on Space.com. The concentration of atmospheric carbon dioxide — a heat-trapping "greenhouse gas" — has risen from 280 parts per million (ppm) before the Industrial Revolution to about 400 ppm today. Scientists think this increase is the major driver behind the warming trend observed on Earth recently. Humanity is largely responsible for the current buildup of CO2, which is at its highest concentration in at least 800,000 years. Our species pumps about 40 billion tons of CO2 into the atmosphere every year through fossil fuel combustion and other activities. Natural "sinks" such as forests and oceans remove just 20 billion tons of the gas from the air every year on average, researchers said. The $465 million OCO-2 mission is designed to help scientists better understand Earth's carbon cycle, identifying natural and manmade sources and sinks of CO2 with great precision. "Now that humans are acknowledging the environmental effects of our dependence on fossil fuels and other carbon dioxide-emitting activities, our goal is to analyze the sources and sinks of this carbon dioxide and to find better ways to manage it," Gregg Marland, a geology professor at Appalachian State University in North Carolina, said in a NASA statement. OCO-2, which is destined for a polar orbit 438 miles (705 kilometers) above Earth, will use a spectrometer to measure carbon dioxide concentrations in the air 24 times every second. It will peer down at the planet with a small field of view — just 1 square mile (3 square km) — so that clouds disrupt its measurements as little as possible. OCO-2 was built to replace the original Orbiting Carbon Observatory (OCO) spacecraft, which was lost shortly after liftoff in February 2009 when the nose-cone fairing of its Orbital Sciences Taurus XL rocket failed to open as planned. The OCO mission cost $275 million. OCO-2's higher price tag is partly the result of NASA's decision to go with a bigger rocket (the Delta 2), which is more expensive and also contributed to a delay of about one year, which also bumped up costs, agency officials have said.